For all your wide format laminating needs, ADSS offers a large selection of large format roll laminators, to quickly get you up and running without added expense of more advanced machines. These wide format laminators are perfect for creating posters, displays mock-ups, banners, signs and other large-format output. Laminating will do more than just protect your printed materials from moisture and accidental spills. Laminating will help to increase the contrast and colors of your display. 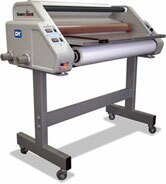 ADSS offers very practical laminating equipment that is easy for you and your staff to use. 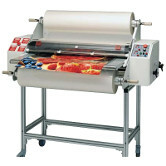 We offer laminators from suppliers such as SuperKote, ValueLam, and Xyron, that will laminate from widths of 38" up to 61". Heat sources vary depending on the laminating machines, from heat plates to heated rollers, while some machines offer cold laminating. Browse our selection of laminating accessories, where you will find an assortment of tools and accessories for your pouch or roll laminating projects, including Utility Workstations, Corner Rounders, and Roll Laminating Cleaning Kits. ADSS has prepared an easy to use comparison chart, to help you compare all the features of Wide Format Laminating Machines. 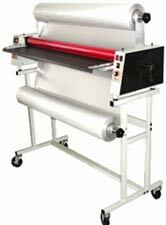 Browse our catalog of Roll Laminating Machines, Pouch Laminating Machines, and Single Sided Laminating Machines. Also, be sure to check out our large selection of Paper Cutters, Laminating Machines, Coil Binding, GBC Binding and Tape Binding Machines. We guarantee you wont be dissapointed! Consult with our knowledgeable staff if there is a particular machine or product you require. Designed to laminate 38" wide format computer generated output. Mounts and laminates up to 10 mil film. The Xyron Pro 4400 is your complete professional document finishing system. Instantly applies laminate, adhesive or both without heat. Perfect for posters, displays mock-ups, banners, signs and other large-format output. 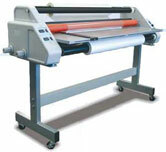 A quality wide format laminator for hot and cold laminating and mounting at an affordable price. 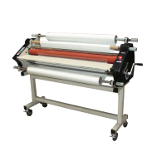 This versatile Wide Format laminator is perfect for laminating using hot or cold pressure sensitive films as well as mounting applications up to 44" wide. 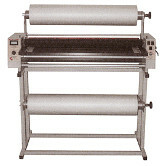 The Tamerica TCC-1200 45'' roll laminator can laminate one- or two-sided film up to 45 inches wide. 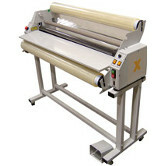 It can laminate all film up to 10 mil thick, hot or cold. Less than 5min warm up time produces scratch free 44" lamination at 16 FPM with 1.8 mil. Laminates hot or cold, one or two side 1mil to 10mil. 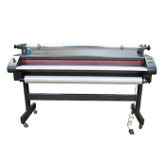 The EXP 62" Plus Laminator offers you the perfect finishing solution for your wide format graphics up to 62" wide With its easy to use display and versatility of using either pressure sensitive or thermal laminating films, the EXP 62" Plus Laminator is the perfect machine for all your wide format finishing needs.